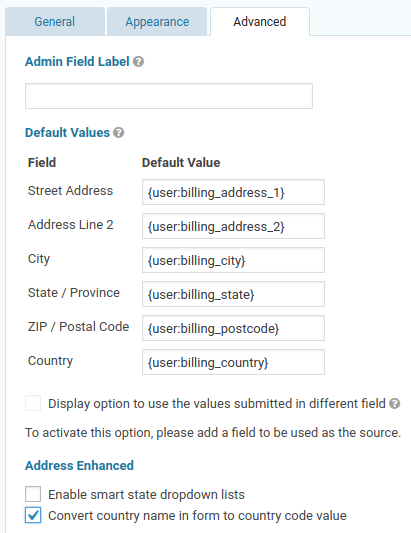 Gravity Forms can be smart enough to load known field values from your website, if you set up your forms to do that. This can be really handy when your existing customers are filling out a form, because you can prefill many fields from their customer record. Most of the time, it’s as simple as using the right merge tag for a field’s default value. 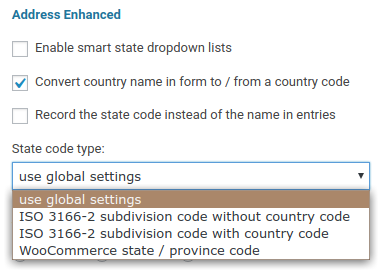 For address fields, there’s a small wrinkle: most plugins store a customer’s country as the ISO 3166 2-character code, but Gravity Forms uses the country’s name in its forms. Which is where Address Enhanced steps in to help. Choose the format that your website uses for state / provinces codes. For compatibility with WooCommerce, choose the WooCommerce state / province format.